EXCLUSIVE GrabHitch Referral Bonus, get $30 (GrabPay Credits)! We are giving you $30 for every friend that you refer to drive with Hitch! More GrabPay Credits to take more Hitch rides – Yay! We will mail the green packets out by early June! If your friend GrabHitch 2x/day to and from work, they stand to recover avg $400/mth! Its up to each driver to decide when to drive and who to pick up! You will get $30* worth of GrabPay Credits after your friend completes ONE ride as a GrabHitch Driver. Do remind your friend to do ONE ride by 31st May 2018*! For more information about April’s PRD, please click here. 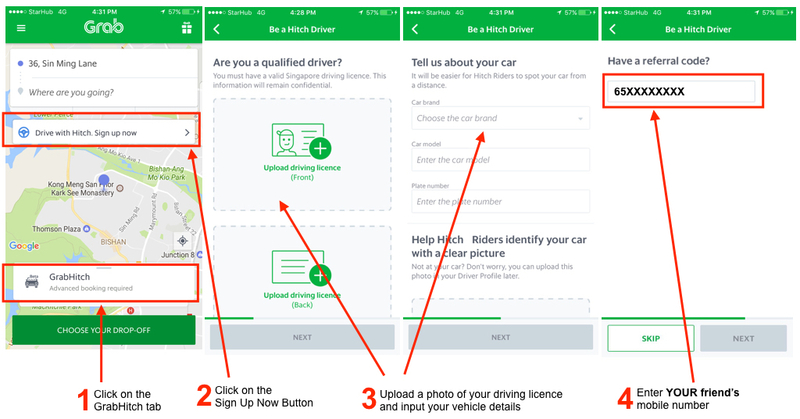 If you also drive, take less than 5 minutes to sign up as a GrabHitch driver! For enquiries on our PRD scheme, or if you have additional feedback on GrabHitch, please email us at : support.sg@grab.com with the Subject: GrabHitch PRD (GrabHitch$30) and we will get back to you in 1-3 working days. Alternatively, do text us at 8429 9032 (Monday – Friday, 10am – 6pm) for assistance. The $30 GrabPay Credits for referrer scheme runs from 1st May 2018 @ 00:00 hours – 31st May 2018 @ 12:00 hours. Existing Passengers and New Hitch Drivers who are suspected to be gaming the system will be thoroughly investigated and GrabHitch reserves the right and discretion to take action in such instances. The Passenger Referral program is only eligible for Grab Users who taken min. 1 GrabHitch ride previously. You will only receive your $30 or more worth of GrabPay Credits + 1 pack of Hitch Green Packets if each referred friend successfully completes ONE GrabHitch rides as a driver by 12:00hrs on 31st May. Each Passenger will only be entitled to ONE pack of Green Packets regardless of number of successful referrals made in May. Passengers will only be sent the pack of Green Packets if he/she opts in via this form. After the referred friend has completed his/her ride as a driver, please allow up to 10 working days after the incentive period has ended (ie. post-31st May) for the $30 or more worth of GrabPay Credits to be processed, and for us to mail the Green Packets to you. Passengers can refer multiple drivers to get more referral rewards, so if you refer 3 drivers who all do 1 ride each, you’ll get $90 in GrabPay Credits. The $30 GrabPay Credits incentive cannot be exchanged for cash. The Passenger Referral program is only eligible for drivers who have never sign up as a GrabHitch Driver. Drivers have to sign up with the Passenger’s mobile number (include 65 in front e.g. 6512345678) and complete (drive) ONE GrabHitch ride by 12:00hrs on 31st May to count as a successful referral.